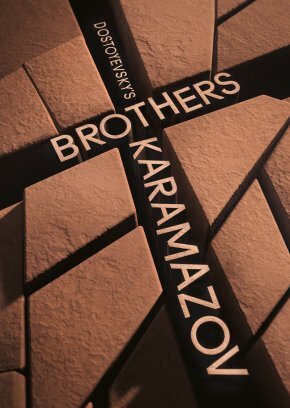 Glasgow Punter: Dostoyevsky's Brothers Karamazov. Tron Theatre, Glasgow. Dostoyevsky's Brothers Karamazov. Tron Theatre, Glasgow. Just writing down the date at the heading of this piece, "October 2017", is a reminder that this month marks the centenary of the October Revolution. One hundred years ago the workers and peasants of Russia, led by the Bolsheviks, overthrew the Tsarist state and established the "dictatorship of the proletariat". Though he died in 1881, Fyodor Dostoyevsky's works demonstrate the tumult of ideas and debate that were going on in 19th century Russia. I find it surprising that there has been very little reflection or analysis in the arts or media about the events in Russia of that time. With that in mind I came to see the Tron Theatre Company revive the 1981 dramatisation of Dostoyevsky's most famous book, The Brothers Karamazov. Dostoyevsky's final novel is often thought of as his masterpiece, a lifetime of thought distilled into 900 pages of psychological angst. The author's own life was no less dramatic than his novels. His early belief in utopian socialism, led to the terror of a mock execution, then banishment to Siberia. He returned to society with his religious beliefs reinforced and his characters often try, often fail, to live the nihilistic or pious ideals that many people of his time believed or feigned. He was also deeply affected by epilepsy, a condition practically untreatable in his time, that often gave him a feeling of profuse calm before a seizure, but then left him drained for weeks afterwards. Epileptics often feature in his stories, most notably Prince Myshkin in The Idiot. In Karamazov the seizures of the fourth, illegitimate brother, Smerdyakov, feature prominently. The other three Brothers Karamazov (Dmitry, Ivan and Alyosha) have all been neglected by their depraved, wealthy father. Ivan is a revolutionary intellectual whose nihilistic belief, like Raskolnikov, that there is no God and "all is permitted" is tested when someone takes him at his word. Alyosha is a pious, Christ-like figure, who follows the religious teachings of the elderly monk Zosima and tries to put his Christian love into practice. Dmitry is a passionate and hedonistic man, who competes with his father for the love of Grushenka. When their father is murdered, circumstantial evidence points the finger of blame at Dmitry. I have written before about Dostoyevsky, and I love reading his meaty books. However Karamazov is not one of my favourites. As ever Dostoyevsky sets out the debate between different ideals before you and gives equal weight to all sides. In this instance few readers get to the end of the book and feel, like the narrator, that Alyosha is the hero of the story. I was inevitably rooting for Ivan, who is driven slowly mad by the guilt he feels for advocating free choice to others. So how do you cram 900 pages on the moral disintegration of society into a 2 hour play with four actors? On a stark stage, with an earthen floor, the four actors perform as the brothers, taking it in turns to don a fur coat or cloak to become their father Fyodor Karamazov, the devil, Zosima or the Grand Inquisitor of Ivan's poem. Whether the stage is meant to represent a crucible or a gladiatorial arena the performers do at times struggle to clamber clumsily around it, and the long speeches used to convey the arguments from the book are also handled incredibly clumsily. As they launch into another lengthy elucidation of a theory, it comes over like a child reading a poem learned verbatim at school. All the words are there, but the meaning and emotion is lost. The performers try their hardest. Thierry Mabonga as Dmitry has an energy that would make you want to spend time in his company, Tom England's Alyosha is a suitably young naive. Sean Biggerstaff makes the most of Ivan's inner turmoil, whilst Mark Brailsford's hammy Smerdyakov leans too much towards caricature to carry any of the malevolence of the book's character. Act 1 is heavy going at times, and there were several people in the audience around us who did not bother with the second half, which was a shame, as things picked up in Act 2. The courtroom scenes allow the arguments of the story to be made in a less contrived manner. The occasional a cappella singing was rather more dystonic than was maybe intended, and did not create any atmosphere of a Russian Orthodox polyphonic chanting, but rather jarred. Dostoyevsky can be successfully brought to the stage, as the Citizens Theatre showed with last year's Crime and Punishment. This Brothers Karamazov as it is performed here, does not wrestle with any of the ideas or philosophy in the novel. The parricide could be presented as the people overthrowing the Tsar or any other dictator and dealing with the consequences. Or you could focus on Ivan, who has dreamy ideals of being able to do whatever he wants, but then is faced with someone acting upon these ideals. The resonances of these notions in the October Revolution, or in nationalist debates in Europe can easily be found, but not in this rendering of the story. The actors don't convey any meaning in their long, expositional speeches, they just batter through the words in the script. Maybe taken at a slower pace, the same script read over an extra hour, it would have room to breathe, but perhaps I am clutching at straws. Sean Biggerstaff has played alongside Alan Rickman in several of the Harry Potter films, and it was Alan Rickman who played Ivan in the original 1981 production. This thought did leave me feeling rather envious of those who saw the play back then.